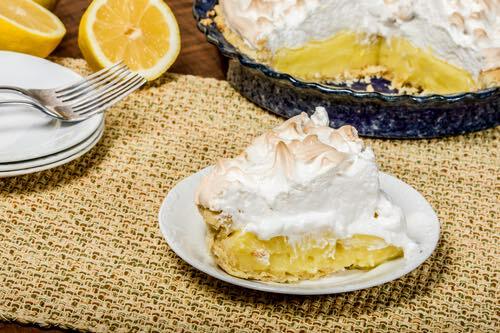 Grandma's easy lemon meringue pie recipes make the best-tasting pies imaginable. Why? Because these tangy lemon pies are topped with a delightful baked meringue that's so good it simply melts in your mouth. I really love eating these old fashioned dessert pies, and you will too. But, I now have a problem: I no longer enjoy eating a slice of lemon pie that isn't homemade! Other pies simply can't match the exceptional taste of these amazing fruit pies crowned with a fluffy homemade meringue. I dare you to bake one and see how good it tastes. Rebecca, a regular visitor to this site, suggests that after adding the 3 cups boiling water and bringing it to a boil, you should allow the lemon mixture to become sufficiently thickened before removing it from the stove and putting it in baked crusts. Beat the whites of the eggs to a stiff froth. Add sugar and spread on top of pies. 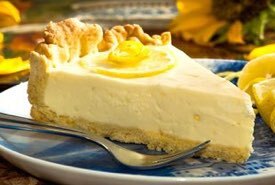 Ingredients: 1/2 cup sifted cake flour, 1-1/4 cups sugar, 1 cup boiling water, 1 to 3 cups milk, 3 egg yolks beaten with 1 egg white, 1/2 tablespoon butter, 2 lemons (1/4 cup juice), grated rind 1 lemon, 1 baked 9-inch pie shell. Meringue: 4 tablespoons sugar, 1/4 teaspoon salt, 2 egg whites stiffly beaten. Combine flour and water in top of double boiler. Add water, stirring constantly; then add milk. Cook until thickened, stirring constantly. Pour small amount of mixture over egg yolks, stirring vigorously. Return to double boiler, and continue cooking until mixture drops in thick sheets from spoon. Add butter, lemon juice, and rind. Cool and pour into pie shell. Fold sugar and salt in egg whites. Pile lightly on filling. Bake in slow oven (300°F) 12 minutes, or until delicate brown. Line a deep pie plate with a rich puff paste, and bake a light brown. Remove from the oven until the filling is prepared. Take a large juicy lemon, grate the peel, and squeeze out every drop of juice. Now take the lemon skin and put it into a cup of boiling water to extract every particle of juice. Put the cup of water on to boil with the lemon juice and grated peel, and a cup of sugar; beat up the yolks of four eggs very light and add to this gradually the boiling lemon juice. Return to the kettle and boil. Then wet a teaspoonful of cornstarch with a very little cold water, and add also a teaspoonful of butter and when the boiling mixture has thickened remove from the fire and let it cool. Beat up the whites of the eggs to a very stiff froth, add half of the froth to the lemon mixture and reserve the other half for the top of the pie. Now bake the lemon cream in the baked pie crust. Add a few tablespoonfuls of powdered sugar and half a teaspoonful cream of tartar to the remaining beaten whites. If you desire to have the meringue "extra thick," add the whites of one or more eggs. 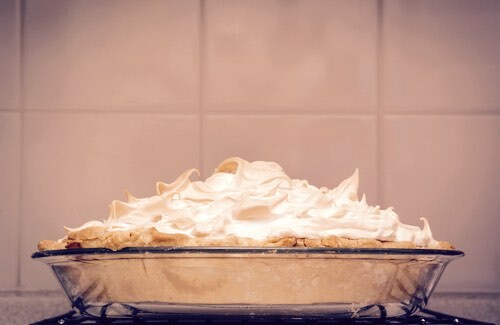 When the pie is baked take from the oven just long enough to spread the meringue over the top, and set back for two or three minutes, leaving the oven door open just the least bit, so as not to have it brown too quickly. Take a deep dish, grate into it the outside of the rind of two lemons; add to that a cup and a half of white sugar, two heaping tablespoonfuls of unsifted flour, or one of cornstarch; stir it well together, then add the yolks of three well-beaten eggs, beat this thoroughly, then add the juice of the lemons, two cups of water and a piece of butter the size of a walnut. Set this on the fire in another dish containing boiling water and cook it until it thickens, and will dip up on the spoon like cold honey. 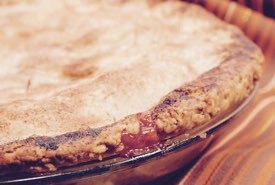 Remove it from the fire, and when cooled, pour it into a deep pie tin, lined with pastry; bake, and when done, have ready the whites, beaten stiff, with three small tablespoonfuls of sugar. Spread this over the top and return to the oven to set and brown slightly. This makes a deep, large-sized pie, and very superior. 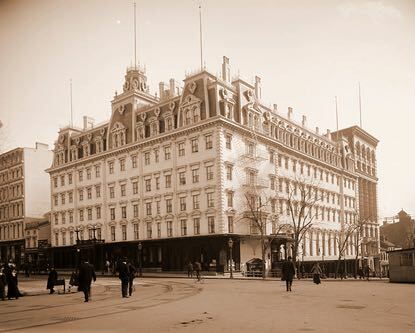 The historical Ebbitt House hotel and first-story restaurant as it appeared around the time the Superior Deep Dish Lemon Pie was on its menu. The entire building was demolished in 1926, and the National Press Club Building was afterwards erected at the same location. If you don't have enough lemons for a lemon meringue pie recipe, try making this delicious orange pie instead. 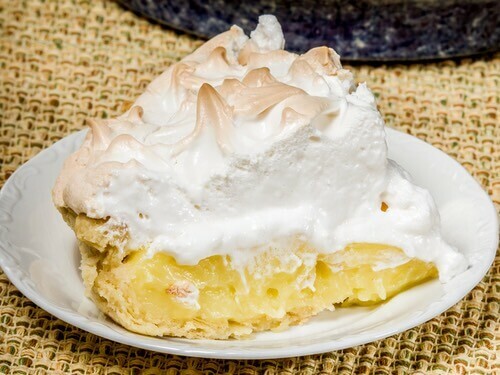 It makes a pleasant change from lemon when topped with a meringue, and it's an easy pie recipe to make. Grate the rind of one and use the juice of two large oranges. Stir together a large cupful of sugar and a heaping tablespoonful of flour; add to this the well-beaten yolks of three eggs, two tablespoonfuls of melted butter. Reserve the whites for frosting. Turn this into a pie pan lined with pie paste and bake in a quick oven. When done so as to resemble a finely baked custard, spread on the top of it the beaten whites, which must be sweetened with two tablespoonfuls of sugar; spread evenly and return to the oven and brown slightly. The addition of the juice of half a lemon improves it, if convenient to have it. Here's my favorite Lemon Meringue Pie Recipe that's easy to make and so tasty! I have been making this for about 40 years, since I was 10 years old or so, and now it's a family favorite. First, make the easy lemon pie. Note: If the crust is large, you may have to double the recipe. Pour 3 egg yolks into a large bowl and just mix them to break them a little. Add 14 ounces of Sweetened Condensed Milk and mix well. Add lemon juice and mix on medium high to high to mix in juice well (pie will be runny if not well mixed). Pour mixture into pie shell and bake about 30 minutes a preheated oven set at 325°F. Next, prepare the meringue topping. Clean your utensils and mixer very well making sure there isn't a hint of egg yolk in sight. It will stop the egg whites from frothing if there is! In clean DRY bowl, pour the 3 egg whites into a larger bowl and whip on high for a few minutes until really frothing. You can add 1/2 a teaspoon of cream of tartar, but it's not really necessary. When they are really frothing, start adding 3/4 cup sugar SLOWLY while you keep whipping on high. Keep adding and you'll notice that the egg whites are beginning to thicken and stiffen. When you reach this point, start spooning the whipped egg whites on the top of the freshly baked pie being sure to spread them somewhat evenly and be sure to seal the edges to the pie crust. You can get a little creative with them too by making waves, curls, adding sugar sprinkles to show a little color, make faces, or whatever you want! When done with the egg whites, put the pie into a preheated oven now set at 350°F for 15 minutes, or until golden brown. Set baked pie on cooling rack, allow to cool, then refrigerate for at least 2 hours before serving. P.S. : This isn't a good lemon meringue pie recipe to make on a very hot and humid day! The extra moisture in the air can impede the egg whites from forming the froth, or getting stiff enough to hold that special curl! However, in air conditioning, it's fine!